Wayne Mansfield: Brussel Sprouts Grow On Trees - I would like to see that! 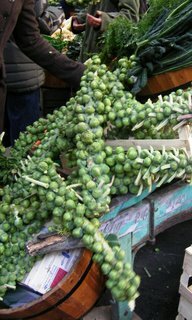 Brussel Sprouts Grow On Trees - I would like to see that! For 54 years I thought brussel sprouts grew like little cabbages until today when I saw them on trees - like giant bunches of grapes. Another illusion destroyed at a visit to the BoroughMarkets London.